Waves are classified into two groups: Destructive and Constructive. Destructive waves are more powerful and cause erosion, whereas constructive waves are less violent and encourage deposition. Destructive waves are formed by strong winds with large fetch areas. These waves are tall and steep, and they have high energy levels that have been built up by travelling long distances and being exposed to strong winds. When they reach land they tend to break strongly and remove material from the shoreline. 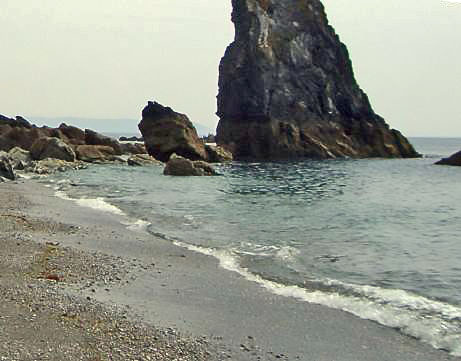 The swash (movement up the beach) is not as strong as the backwash (movement down the beach) so the overall effect is to erode beach material. 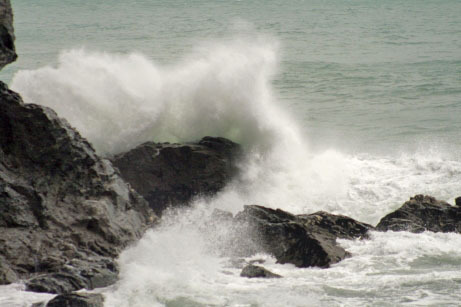 You will see destructive waves if you visit the coast during or shortly after a storm. The swash of the wave tends to push material up the shore and the backwash tends to wash it back again. If there are a lot of waves they catch up with eachother on the beach and the backwash of one wave will tend to meet the swash of the next wave. This will limit the motion of the water up the beach and pull some material back out to sea. Less material will be pushed up the beach. The backwash will be the most powerful process and there will be a net loss of material from the beach. Typically between 10 and 14 destructive waves will break every minute. Constructive waves deposit more material than they erode. They predominate in calmer weather conditions when less wind energy is being transfered to the water. They are also associated with shorter Fetch distances. 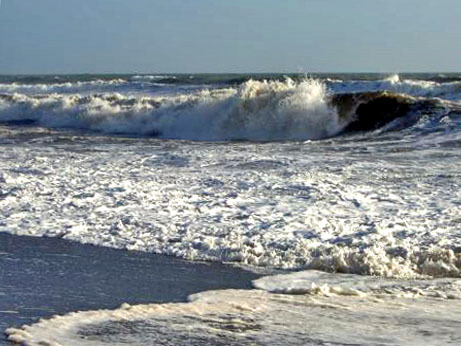 They are typically low and long waves with a powerful swash that pushes material up the beach. Constructive waves will sometimes not seem to break at all but just run up the beach losing energy as they do so. Because the swash is more powerful than the backwash, more material is carried up the beach than is pulled back down it. This leads to an increase in beach sediments. If there are not many waves each wave will be able to complete both its swash and backwash without interference from the next wave coming up the beach. Sediment that has been pushed up the beach by the swash will be deposited up shore, and the backwash will drain away into the sand. When the next wave breaks its swash will deposit more material without it being ‘captured’ by the backwash of the preceding wave. Typically, between 6 and 9 constructive waves will break every minute. Swash: When a wave breaks and the water travels up the beach this is called the swash. Swash pushes sediment up the beach away from the sea. Backwash: When the water from the waves starts to run back down the beach it is called the backwash. Backwash pulls beach material towards the sea. Destructive waves are associated with stormy conditions and occur where there is a long fetch and strong winds. The waves in the picture were breaking at a frequency of 14 per minute, each swash being interrupted by the powerful backwash of the previous wave. When a destructive wave hits a cliff the water can hit the rock face with the same sort of force as driving a car into a brick wall at 30mph. The same power that can smash ships to pieces against the rocks is constantly eroding the cliff face. Tiny pockets of air, trapped in the cracks and hollows of the cliff’s surface, undergo immense compression as the waves hit , forcing the air into the rock surface and creating ‘mini explosions’ that weaken the rock. Constructive waves are associated with calm weather. These waves were hardly breaking at all, but it was clear that small particles were being pushed up the beach. Some lateral movement was also taking place (longshore drift) , material being moved from the background to the foreground. The frequency of these waves was 6 per minute.